MICHAEL MANGAN RECEIVED his third kidney transplant in December 2016. Michael previously led a very active life, playing hurling with Dublin for several years until he retired in 1989. He didn’t smoke or drink but was diagnosed with kidney failure at the age of 30. He had his first kidney transplant in 1995, and two more in 2002 and 2016. In 2002, he also had a triple bypass and has developed skin cancer twice in recent years – something caused by the immunosuppressive medication he’s on (this helps stop his body rejecting his new kidney). In 2014, he and Dr David Hickey, former transplant surgeon at Beaumont Hospital in Dublin and All-Ireland winning footballer, set up Patient2Patient Shared Experiences (P2P) – a support service that links patients affected by renal and pancreatic failure. Since then, Michael has met over 400 people suffering from end-stage renal failure – patients on dialysis or in need of kidney transplants. As well as receiving treatment for skin cancer, Michael has to have regular heart check-ups but, overall, he says he’s doing well. He spends most of his time running P2P, travelling around the country to meet patients. In an average week, three or four new patients contact P2P for support, as well as repeat patients keeping in touch. Michael tells TheJournal.ie that most of the people he meets are those “starting out on dialysis and hoping they get on the road to a transplant”. “Having had three transplants, I can offer advice. Talking to someone who has been down the road in front of them can help. Michael says family members of kidney patients also get in touch, noting how difficult it can be to deal with changes in the family environment, such as the upheaval caused by dialysis. “A healthy person, now needing dialysis, could be in hospital several times a week for hours at a time, or at home receiving nocturnal dialysis, seven nights a week. Michael says he typically spends at least an hour with a patient, talking about their concerns. People usually want to meet in their own homes and last year Michael clocked up 38,000km visiting patients. He says he’s “very lucky” that Renault Ireland has provided P2P with a car, while he pays for the fuel himself. “My old banger wouldn’t get me around the country,” he jokes. It costs around €35,000 per year to run P2P, with just under €10,000 going on his salary. This money is raised through donations and charity events like golf classics. Michael says more donations are always welcome, noting that, where possible, any extra funds are given to kidney patients who may be struggling financially. 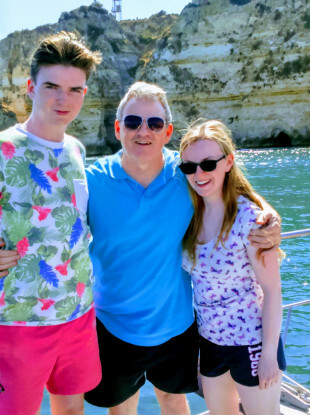 Michael says his “wonderful” wife Caroline has been “the backbone of the family” since he was diagnosed with kidney failure in 1994, looking after him before and after his transplants and bypass. She also looked after their three children – Catherine, now 26; Laura, 22; and Michael, 17 - while he was in hospital – sometimes for months at a time. A record number of transplants were performed in Ireland in 2017 – 308, up from 280 in 2016. “Our message is simple, organ donation saves lives,” Professor Jim Egan, director of Organ Donation and Transplant Ireland, said in a statement last month. Thanks to the generosity of 98 families donating the organs of their loved ones, 308 people have received the gift of life. Recalling the period before he received his third kidney transplant, Michael says his wife’s brother Andrew, then 49, offered to give him a kidney when he found out he had terminal cancer. Andrew wasn’t able to donate his organs due to his illness, but Michael says he’ll always be grateful for the selfless offer. “I got a kidney three months later,” Michael adds. In 2013, an Oireachtas Committee found that changing to a ‘soft opt-out’ system could “vastly increase“ Ireland’s rate of organ donation. Such a system is expected to become a reality in Ireland this year – something Michael welcomes. Last month, the Department of Health released a report on the public consultation process carried out around legislation that would bring in an opt-out system of organ donation. The majority of the 261 respondents expressed support for the proposal. “83% of consultation respondents stated that the proposed opt-out system would encourage them to discuss their intentions regarding organ donation with their next-of-kin. “It is important that we all consider our position on organ donation and that we make our views known to our loved one,” Health Minister Simon Harris said in a statement at the time. Under the new system, next of kin will still have the final say about a loved one’s organs. There has been an increase in people requesting organ donation cards recently, thanks to awareness being raised by lung transplant patient Orla Tinsley and lung and heart transplant patient Isabel Terry. Organ donor cards can be obtained by phoning the Irish Kidney Association on 1890 543 639 (lo-call) or by texting the word DONOR to 50050 (free). More information can be read here. People can also download the IKA’s digital donor card here. More details about P2P can be read here. Email “Michael has had three transplants and is helping other patients come to terms with kidney failure”. Feedback on “Michael has had three transplants and is helping other patients come to terms with kidney failure”.